Poslovna Linux konferenca (Business Linux Conference) is an annual event in Slovenia, focussing on the use of Linux and other open-source software in business environments. This year the conference took place in Portorož on the 28th and 29th of September. XtreemOS was presented by Marjan Šterk and Matej Artač (both from XLAB) as a platform for collaboration both within companies and across company borders. A potential use case in an architectural bureau was used to enumerate the most important features of XtreemOS in businesses: sharing files with XtreemFS, exploiting grid resources for automatic compilation of project documentation, marketing material, animations etc, and use of applications installed on remote computers without the need for local user accounts. A simplified live demonstration of these features was also shown. 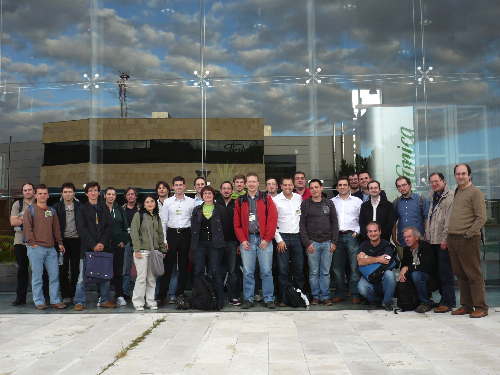 From 6th to 9th October, a General Technical Meeting was organized at Telefonica I+D premises in Valladolid, Spain. With a large participation of around 40 people, the meeting was very productive, including many sessions devoted to security aspect, as well as XtreemOS file system, changes in AEM, etc. Plenary sessions for developers (specially focused on release 2.0 and also the future 2.1 release before Christmas), for demos and also for performance evaluation were also important in the agenda. But not everything was just work, and the partners have enjoyed some activities "out-of-agenda", like a guided tour in Valladolid and the social event in Bodegas Arzuaga, one of the best wineries in the region (Ribera del Duero), where we visited the cellar and also enjoyed a dinner with the typical "lechazo" (young lamb) from Castilla. With a special mention also for "tapas": some XtreemOS members became experts and practiced this "regional sport" in even 5 different bars in just one night! It is interesting to mention as well the visit from the chairman of Telefonica I+D premises in Valladolid, taking the opportunity to take some photos and to write a press release that will be published internally in Telefonica and also in regional newspapers.